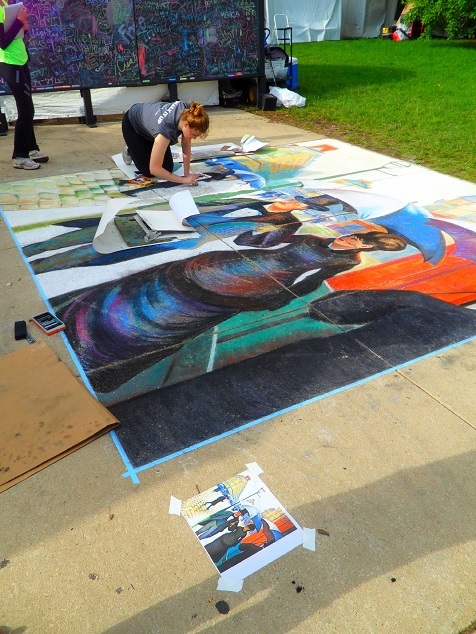 While walking around the wonderful Gold Coast Art Fair in Chicago yesterday, I stopped to watch a group of young artists recreate a masterpiece on the sidewalk with chalk. The masterpiece they were recreating was Gustave Caillebotte’s Paris Street; Rainy Day – which just so happens to hang in the nearby Art Institute of Chicago. Hi there everyone – I am posting this from Chicago, where I come every year around this time to enjoy all the diverse offerings of this great American city. I planned this year’s trip around the Gold Coast Art Fair which is being held today and tomorrow in Chicago’s glorious Grant Park – between the world class museum, the Art Institute of Chicago, and the picturesque splendor of Lake Michigan. I visited the Art Institute yesterday and am pleased to say it was as wonderful as ever – and I visited my friends, the iconic lions who stand guard at the museum’s Michigan Avenue entrance. In the coming days I will be sharing details of my trip and all my Chicago “finds” – so stay tuned. Meanwhile, today I will be heading to the Gold Coast Art Fair and Randolph Street Market. 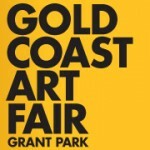 The 2013 Gold Coast Art Fair will be held June 29 – 30, 10am-6pm in Chicago’s Grant Park. 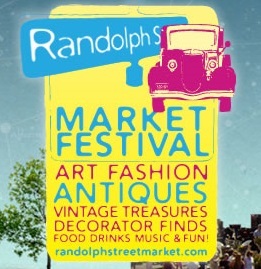 The Randolph Street Markets are held one weekend a month – check here for a schedule. Meanwhile, down scale from the high-end annual Art Fair and the hipster cool Randolph Street Market, is the weekly Maxwell Street Market – a Sunday Flea Market that runs the gamut from household goods to vintage items to new arts and crafts. 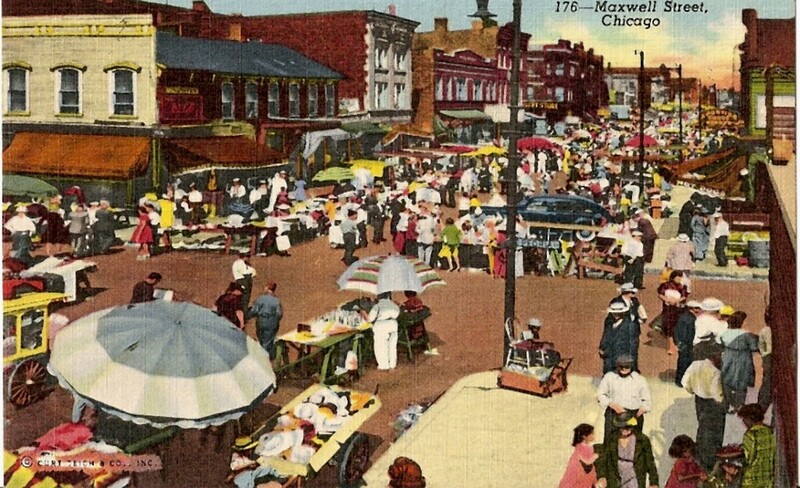 More than just an urban swap meet, the Maxwell Street Market is the legacy of an old world market held in this area for decades and still features produce and tons of food stalls – some touted by real foodies. Maxwell Street Market runs Sundays 7am-3pm – more info here. I always wanted a foosball table in my house. However, until now I never saw one that I thought was worthy of the space it would take up… the 90 Minuto foosball table from Bespoke Global is a piece of furniture and a work of art. 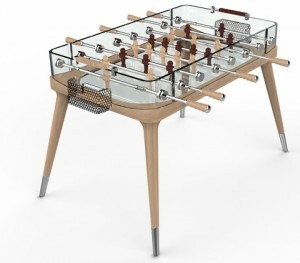 See The 90 Minuto foosball table from Bespoke Global here. I have mentioned before that even though New Hampshire (where I am) and Vermont are right next to each other and share a border that runs the length of each state, it is really not easy getting from one to the other. From where I am in eastern central New Hampshire, it is almost impossible to get to Vermont without going way out of your way – with the big lakes, mountains and other natural barriers in between. That said, finding places like Robert James Walsh & Company (specializing in “Antiques – Art – Modernism – Appraisals – Design”) in Quechee, Vermont makes me want to scale those mountains to make the trip. 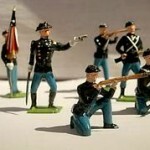 Robert James Walsh & Company’s collection of toys soldiers is reason enough to go. 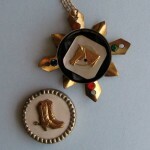 Check out Robert James Walsh & Company here. This week’s bourbon is the awesome Single Barrel Bourbon of Michter’s. Discover more about the Bourbons of Michter’s here. I know, I know, you have all been wondering how I was making out so far this season with my container garden. My apologies, I have been busy over the past few weeks and have not had a chance to snap pictures and write an update until now. That all said… my container garden is doing quite well. 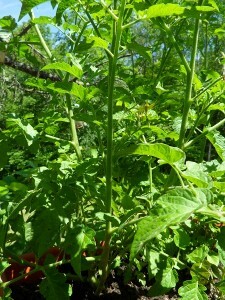 My tomato plants in particular have experienced great growth and from the number of bright yellow blooms I have seen, I think I am going to have a nice crop of tomatoes in a few weeks. 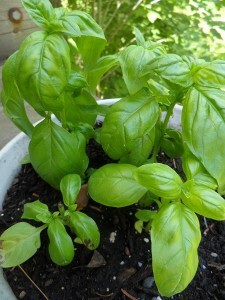 Meanwhile, my basil plants are doing very well also. Now only if I could figure out how to make that fresh mozzarella cheese and I would have everything I need for my favorite summer meal. The only think I have to worry about now is how my plant will fare over the coming days while I am away in Chicago. I am hoping there will be a few rain showers here and there to keep the soil moist. I’ll let you know how the plants make out. We are well into June which means that barbecue season is well underway and to help make sure we make the most of it, innovative chef Adam Perry Lang has released a new book, Charred & Scruffed, which offers us new ways to think about the way we cook on the open flame. In Charred & Scruffed, Adam Perry Lang challenges many of the traditional ways we barbecue and some of his ideas are things I am excited to try. More than anything, I love someone who encourages us to experiment and be bold in our cooking and this book does just that. 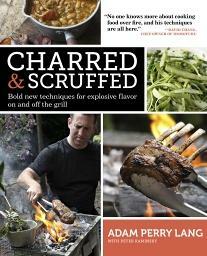 Charred and Scruffed by Adam Perry Lang is available from Amazon and other fine booksellers. A couple of weekends ago when I attended Arts Fest Beverly, my booth was fortunate to be located next to the booth of Twitch and Whiskers and its owner, Mei-Ling. While setting up our tents Mei-Ling and I became instant fair friends as we quickly established our common fondness for taking castaway vintage items and turning them into art – me with my assemblages and she with her awesome “upcycled” jewelry. 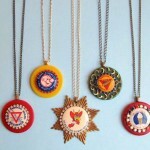 Mei-Ling takes vintage items like old buttons, game pieces and thimbles and turns them into modern works of art meant to be admired as much as they are made to be worn. Visit Mei-Ling’s Twitch and Whiskers blog here. Visit Twitch and Whiskers’ Etsy Shop here. I took a lot of heat (pun intended) for featuring a soup recipe last week. I stand by my endorsement of eating hot soup in the summer, but I thought today I would present a more traditional summer-themed recipe: this recipe for Sweet Tea Granita I found in Garden & Gun magazine. Garden & Gun’s Sweet Tea Granita recipe is from Atlanta chef Andrea Litvin, who adapts her family recipe for traditional southern sweet tea into an icy, lemony, summer treat. 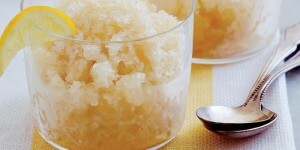 Find the recipe for Sweet Tea Granita from Garden & Gun magazine here. See more from Garden & Gun magazine here. 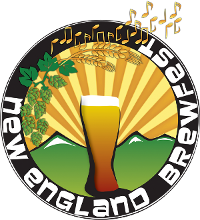 If you are free on Saturday, June 29, like beer, and are in northern New England, then the 9th Annual New England Brewfest may be just the ticket for you. The Brewfest, in Lincoln, NH in the gorgeous White Mountains region, is an opportunity to sample beers from all over New England and just have a good old time. Learn more about New England Brewfest here. There is always a reason to visit our nation’s capital, and one of the best reasons to visit DC is the never ending bounty of the museums of the Smithsonian Institution. 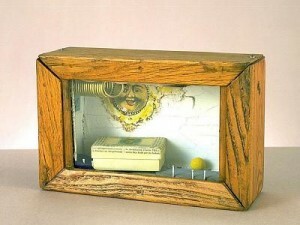 Currently, the Smithsonian’s Hirshhorn Museum is hosting an exhibition celebration my favorite artistic medium – the assemblage: Over, Under, Next: Experiments in Mixed Media, 1913 to the Present. I have been inspired by the great assemblage works of artists old and new, and this exhibition not only celebrates the medium, but validates the choices of artist like me. Over, Under, Next: Experiments in Mixed Media, 1913 to the Present continues as the Smithsonian’s Hirshhorn Museum through September 8, 2013. Learn more about all the museums and resources of the Smithsonian Institution here. ON THE ROAD: The first day of Summer? Today, June 21 is the day of the Summer Solstice in the Northern Hemisphere. As such, today is the longest day of the year and the official first day of the summer season. Here in New Hampshire we know that summer is fleeting and we try to make the most of every second of it. 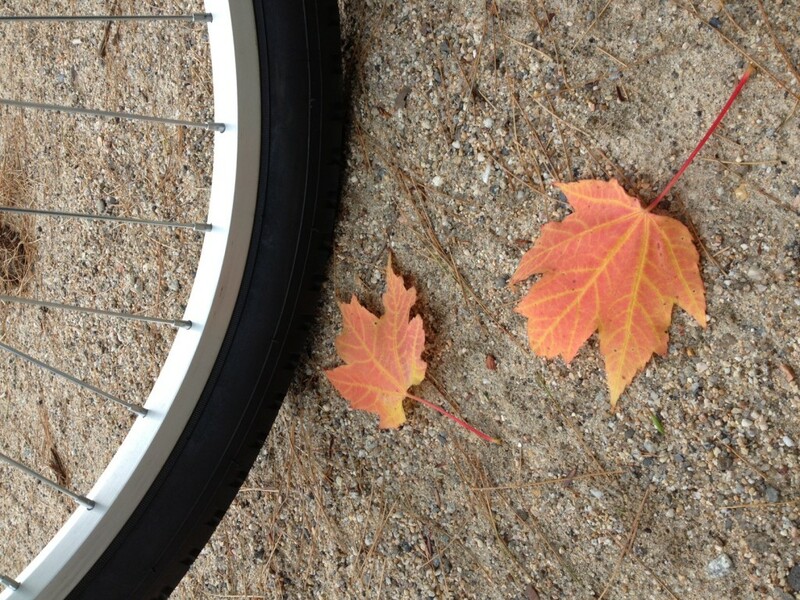 However, I have to say I was a little sad to find a sure sign that autumn will be here all too soon. The picture below was taken on my bike ride in Sandwich, NH yesterday afternoon. Is today the first day of summer or the turning point in the inevitable march to winter? Lost Cowboy is powered by	WordPress 5.0.4 and delivered to you in 1.009 seconds using 58 queries.